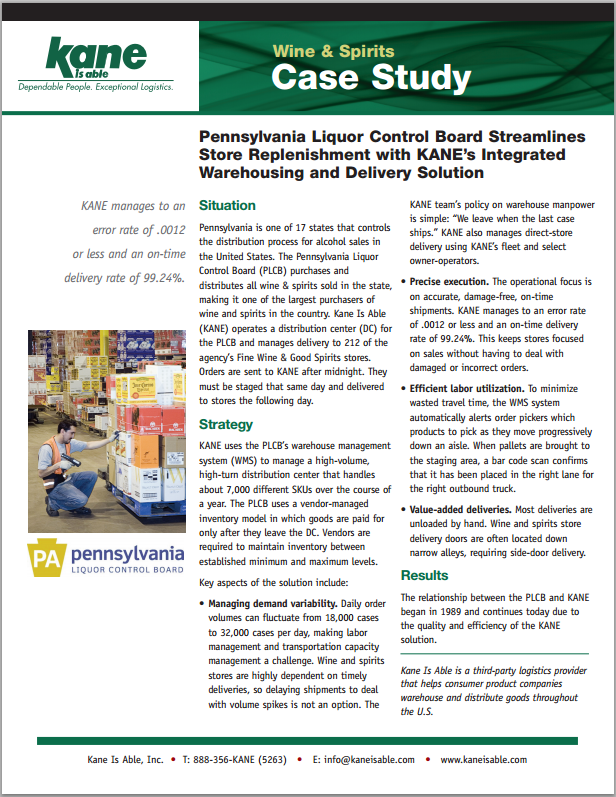 The Pennsylvania Liquor Control Board (PLCB) is one of the country’s largest distributors of wines and spirits. The PLCB sought a distribution partner that could offer an integrated, closed-loop solution for warehousing and direct-to-store delivery. KANE was awarded the contract for Northeast Pennsylvania in 1990. Based on a history of service excellence, KANE continues to serve PLCB today from 250,000 square feet of temperature-controlled distribution center space in Scranton, PA, handling about 7,000 different SKUs. Complete the accompanying form to read the full story.